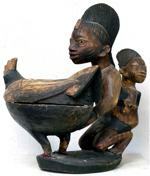 This page features Ibeji, twin figures from the Yoruba culture of Nigeria. 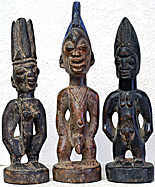 The Yoruba have one of the highest rates of multiple births in the world. The figures are made to accommodate the soul of a dead twin. Careful attention to the twin figures by the family assures a long life for the remaining twin.